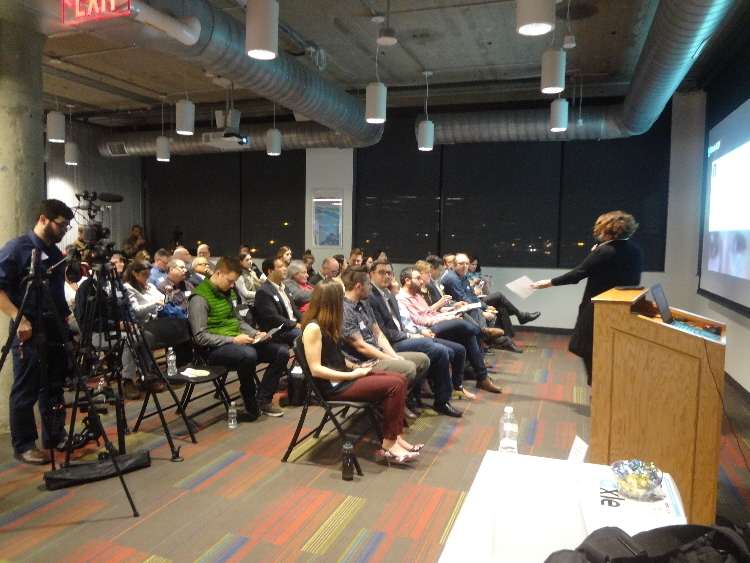 This month, Mass Innovation Nights held their startup showcase out along I-495, well away from Boston. 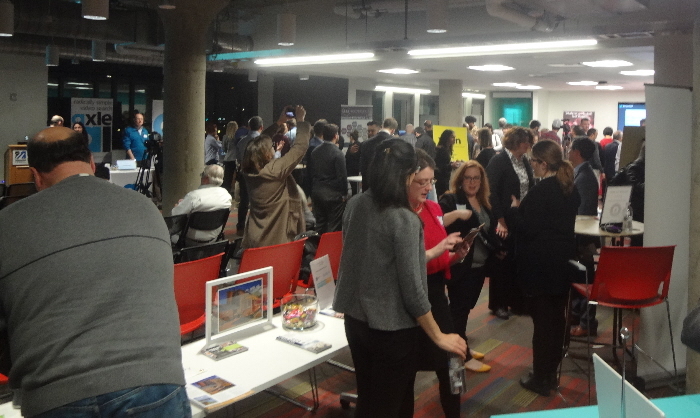 This worked well for me, and it seems there are a lot of other tech and startup supporters who appreciated the visit to the outer suburbs and satellite cities like Lowell, as the event drew great attendance. 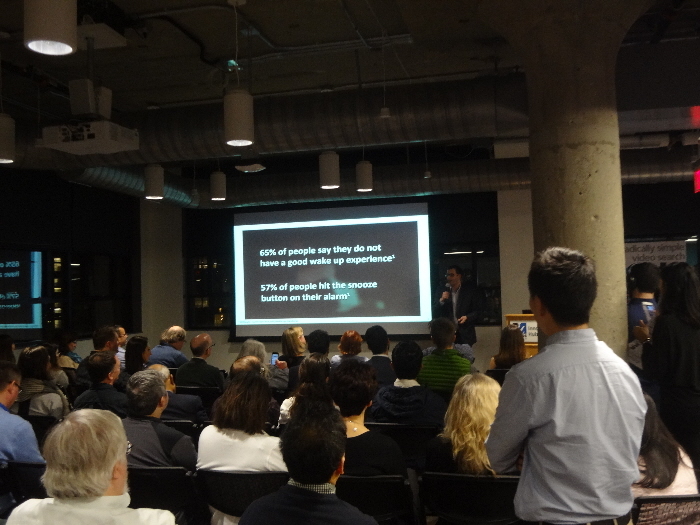 Every month, Mass Innovation Nights features presentations from the host, the “Expert Corner” experts, and exhibitors who win a pre-event vote on the Mass Innovation Nights website. Presenters as a result of the pre-event voting were Wake Me, wmnHealth.org, Adopets, and Caide Systems. Awards were also given based on at-event voting. 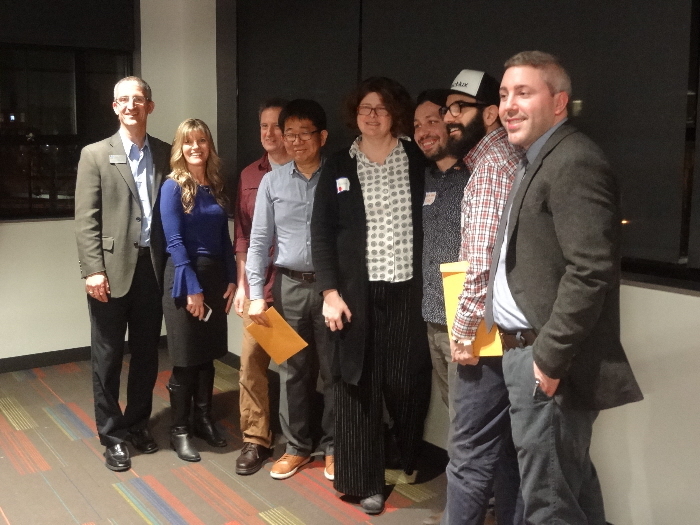 At-event winners were DSP Wireless, Exact Lux, Adopets, and Caide Systems. WakeMe is a social media alarm clock. It hopes to encourage people to get out of bed more easily by offering a positive experience, showing videos from friends and family when the alarm goes off. WakeMe’s presentation did a good job of identifying the numbers behind its millennial target market. Revenue streams include sponsors, automated advertising, and subscriptions. The subscription option brought to my mind an interesting question: How much would you pay to get a wake-up message every morning from your favorite Telecom & Tech blogger? 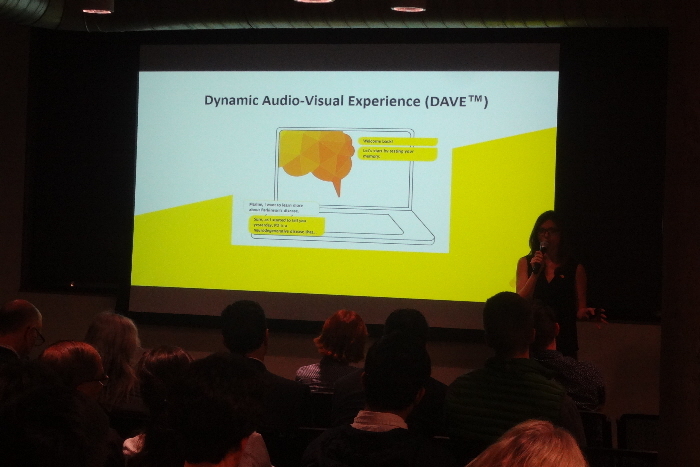 wmnHealth.org is Dynamicly Inc.‘s conversational platform for women about mental and neurological diseases. With the stated intent to promote conversation and research and development using AI and analytics, wmnHealth.org includes a daily flash briefing via Alexa. The dominant – or, at least, most attention-grabbing – feature is its chatbot, Marine. Perhaps, though, to avoid anti-chatbot backlash, I should refer to Marine as the website does, an “artificially intelligent virtual assistant powered by Dynamicly’s conversational computing technology.” Certainly, it’s an interesting concept worth digging into. Adopets is a pet adoption management platform that allows people interested in adopting pets to view animals across locations. Provided at no cost to the shelters or the potential pet-adopting individuals. Instead, the Adopets hopes to monetize via post-adoption offerings. 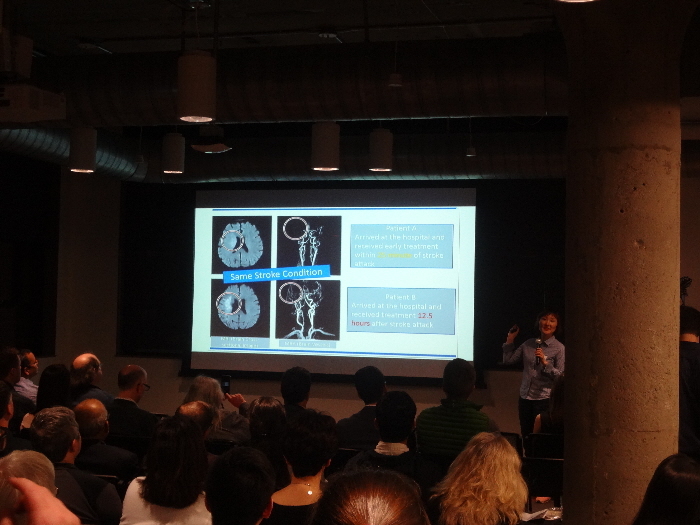 CAIDE Systems has a proprietary artificial intelligence deep learning package that it has developed for medical AI. Its product can reduce the time taken to read a CT scan from possibly an hour to as few as two minutes or less, reducing human error in the process and potentially saving critical minutes in helping to diagnose brain stroke. 360 Properties LLC uses Matterport technology to create 3D virtual reality representations of real estate, allowing agents and property sellers to offer complete virtual tours. The detail offered in these tours is exceptional, with the web tours fully covering the views within and around the properties shown. 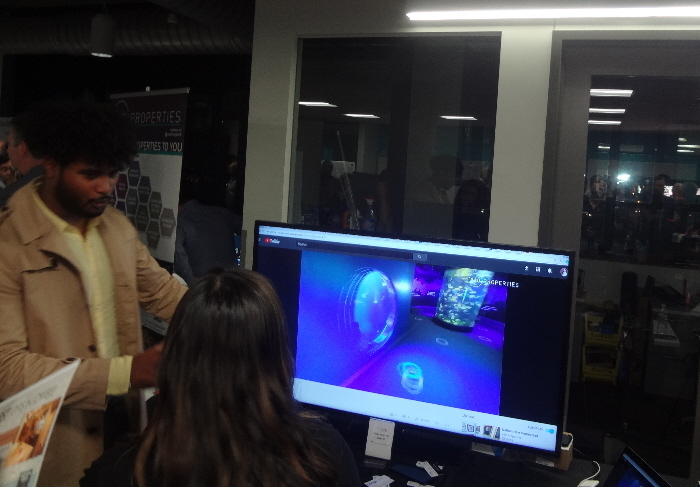 In addition, the company had a virtual reality headset at its demo table that provided a very cool experience. Cool because, of course, it’s VR. It’s worth going to the 360 Properties website to explore for yourself. Flos Horticultural Lighting: FLW900 is Exact Lux’s LED light designed to produce maximum yield from plants. Per Exact Lux, the FLW900 is the most powerful LED grow light currently manufactured. Beyond the obvious in-building horticultural products, Exact Lux discussed the company’s possible next frontier: chickens. But, initially, the business model’s first product target is a more obvious path. axle ai is a media-finding tool from axle Video to content creators search for and repurpose video content. Its target market is small and midsized media teams, perhaps posting to social media or creating course material, with likely industries including universities, sports teams, and houses of worship. Two scheduled attendees, Probit Systems and Perch, weren’t in attendance. Probit provided some literature to sit on a table, at least, while Perch was completely absent. The presenting “experts” this evening represented the UMass Lowell Innovation Hub and the City of Lowell Department of Economic Development. The networking portion of the evening – before and after the presentations, including last night’s official afterparty at Coffee and Cotton – is always as important as the presentations themselves. On this particular evening, in addition to allowing me to chat with each of the presenting companies and get up-close views of some of the product, I ran into key players and founders from companies like wearable tech firm Invisawear (smart jewelry and accessories), e911MD (a virtual 911 and medical app), and EforAll (an entrepreneurship accelerator and training and mentoring program). As with other MIN reviews, I’ve done my best to accurately portray the products I saw exhibited based on the literature I read and conversations I had with attendees; hopefully I’ve succeeded. Most of what I’ve written could easily enough be found by following this link and then clicking on the “Vote Here” tab of the MIN 107 web page, and I’ve included hotlinks to the websites of each of the companies I’ve mentioned so you can dig deeper, but hopefully this article serves as a decent introduction. I always enjoy attending the MIN events, and I plan to get to several more in the coming months as my schedule allows. The next MIN event is scheduled for March 14 at Brandeis University, and I plan to be in attendance. As always, if I’m there, I’ll blog about it.